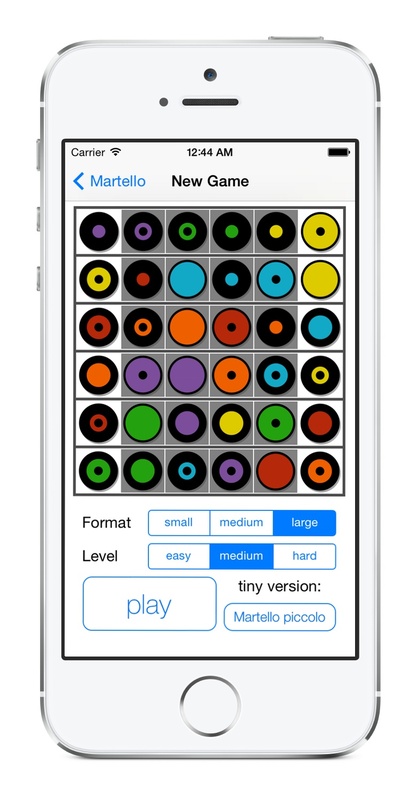 Martello is a simple yet challenging board game for a single player. Try to move and eat the pieces on the board until only a single one of them is left. 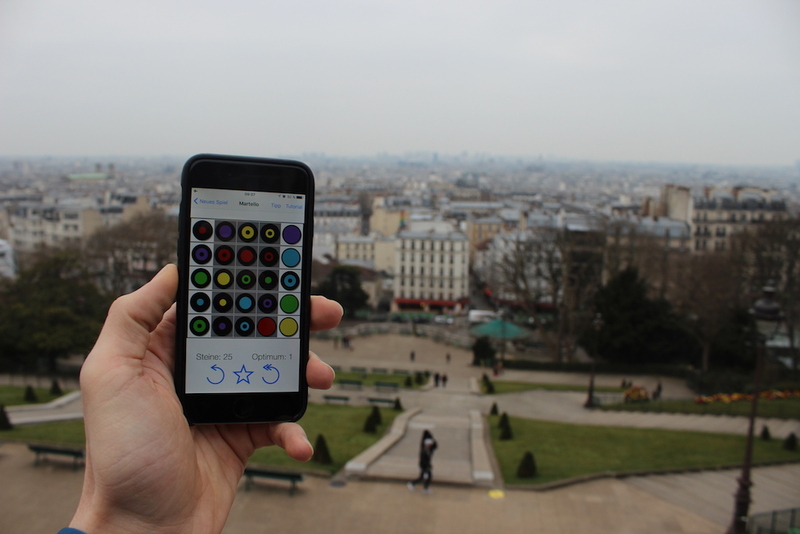 A colorful combinatorial game for everyone! 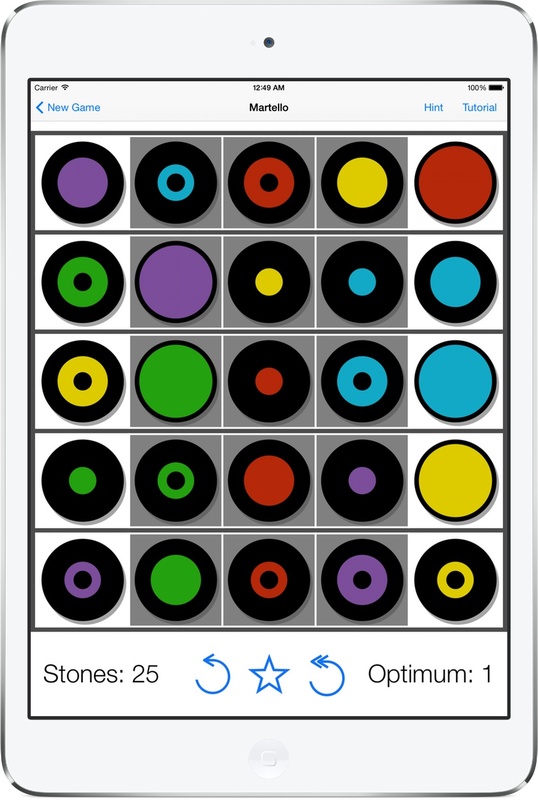 Let's play on a square board with 36 pieces in 6 colours and 6 symbols. The aim is to eliminate all but one piece. The main rule to consider: “neighbour eats neighbour”, but only if they have the same colour or the same symbol. There are two kinds of neighbours: Horizontal neighbours: two pieces in the same horizontal row with no other piece in between. Vertical neighbours: two pieces on the vertical white zone at the edge of the board, on adjoining white squares. On this page you can find a detailed background story, press material and a some more infos about the app. 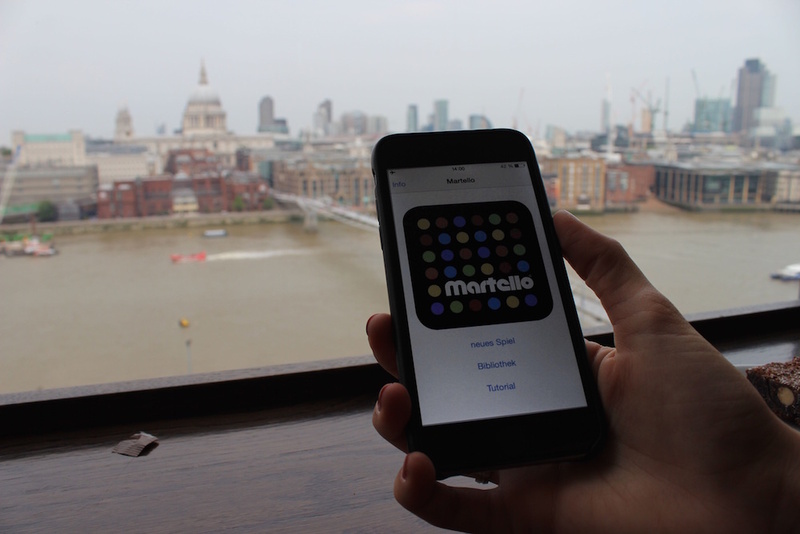 Martello was invented in 1976 by the Swiss mathematician Peter Hammer. In 1984 it was launched as a board game with the support of the game producer Mändu Stauffer. The graphic artist Jürg Peter Hunziker created the visual look of the game. 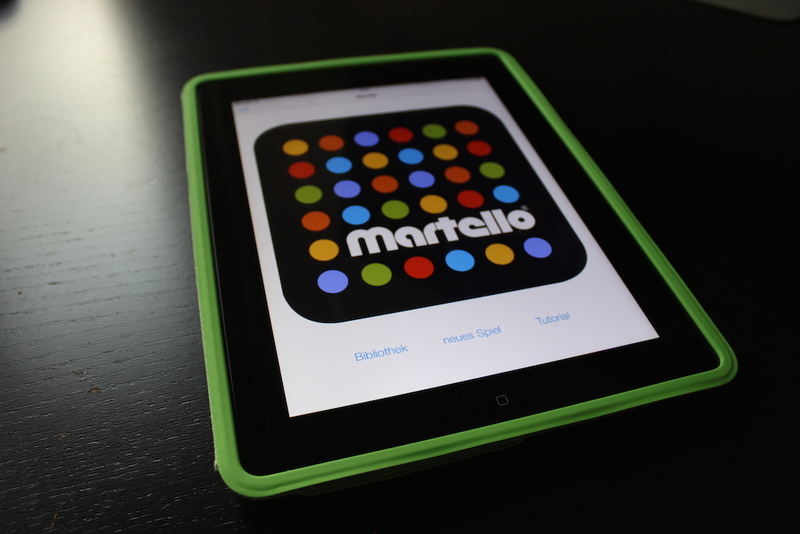 Daniel Graf implemented the game anew in the form of an app and so Martello was released in April 2014, 30 years after its creation. Emily Wangler ported the app to Android. If you have any questions or feedback, we would be delighted to hear from you. 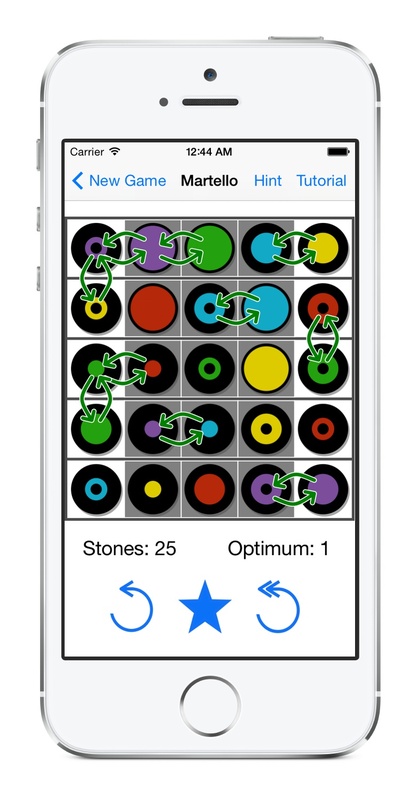 The app is available for free in the iOS App Store for the iPad, iPhone and iPod touch as well as on the Google Play Store for all Android phones and tablets. We have put a lot of effort into making the game as accessible to beginners as possible and at the same time also challenging for more experienced players. An intelligent assistant continuously analyses the game in the background. He can show you all good moves or just a single hint. A label in the bottom indicates whether removing all but one stone is still possible and so tells you if you are still on the right track. The Library keeps track of all the games that you started and solved. It also stores if you used a hint from the assistant, so that you can retry without any help later. The mathematician Peter Hammer (1951) was a member of the Swiss national team in chess and a passionate card player in the seventies. In 1976, on vacation in Greece - first with Swiss Jass cards - the simple idea of «neighbour eats neighbor, if they match in suit or rank». If only one line is layed out this idea is quite useless as there are only few combinations. But if the 36 cards get placed into six rows with six cards each and one allows vertical movements only at the edge, then a wonderful world awakes. In 1977, the 36 cards got replaced by 36 pieces numbered from one to six in order to also incorporate the symbols of a dice into the game. In 1981, at the chess grand master tournament in Biel Peter Hammer got to meet the Bieler game producer Mändu Stauffer. A friendship developed and the idea to produce a board game together came up. 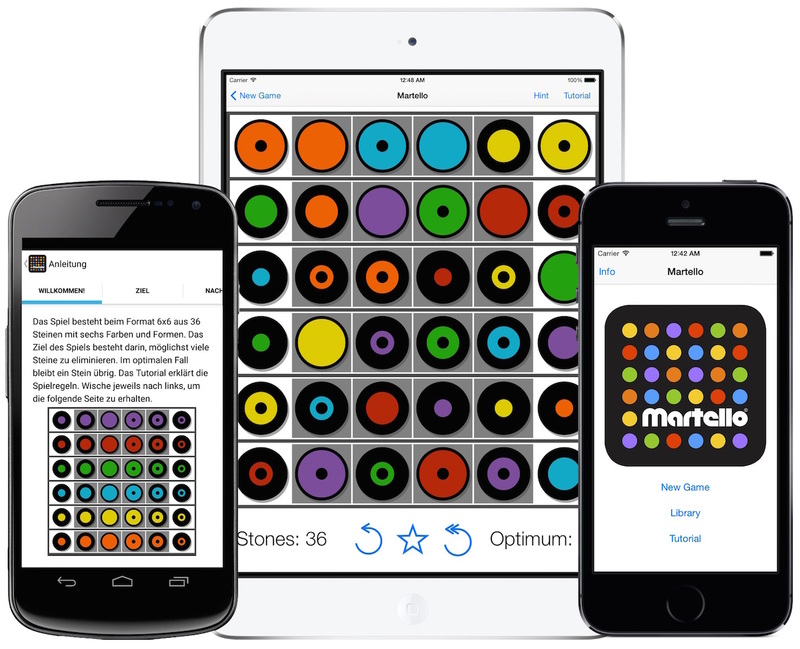 In 1983, the graphic designer Jürg Peter Hunziker from Solothurn invented the design of the game Martello. 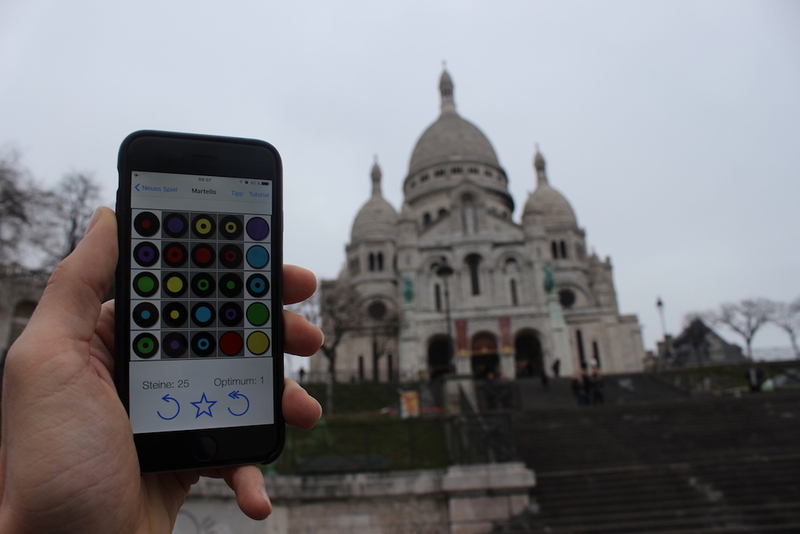 He created with six colours and six symbols – as points and rings – the 36 different pieces of the game. 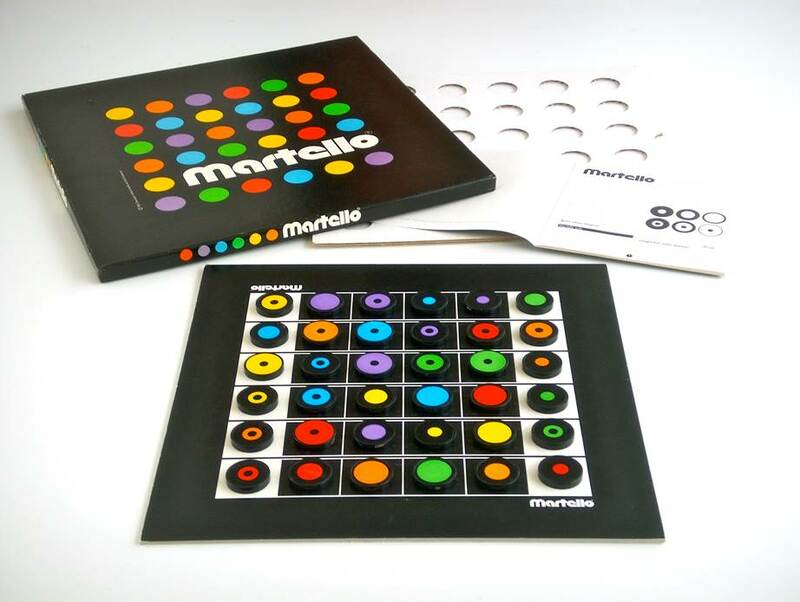 In 1984, the board game Martello was released. It can still be purchased at Fata Morgana. 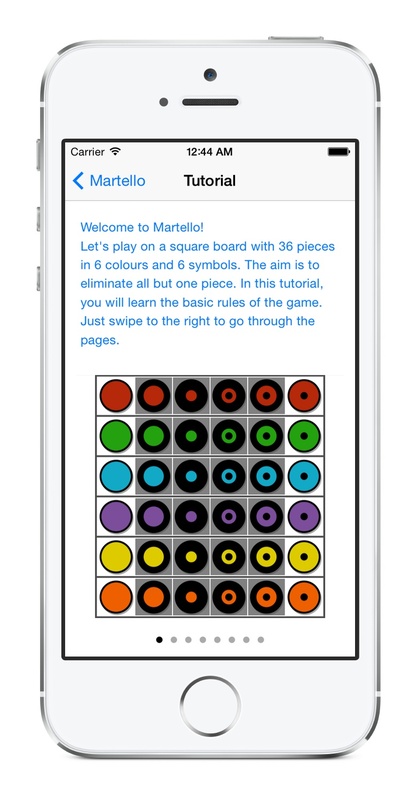 In 2013, Peter Hammer contacted the ETH computer science student Daniel Graf from Vilters to develop a game based on Martello. Graf used the digital space and added ideas like varying the size of the board. He also did a small research project under the supervision of Prof. Luke Zettlemoyer at the University of Washington in order to create the solver for the game. You can find out more about the solver in this report. 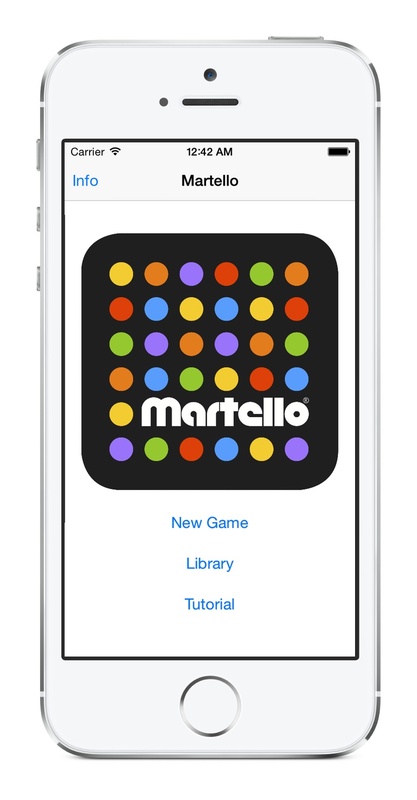 In April 2014, or 30 years after its creation, Martello got released as an app online. In November 2015, Emily Wangler ported the app to the Android operating system. When and where can I get the app? The app can be downloaded in the iOS App Store and is available worldwide for free. 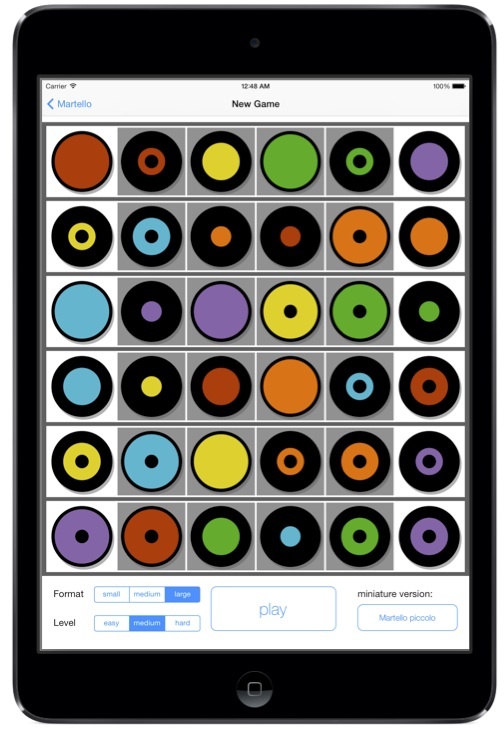 It runs on any iPad, iPod touch and iPhone with iOS 7.0 or later. The Android version is available in the Google Play Store and requires Android version 4.3 or higher. A detailed explanation of the rules can be found in the interactive tutorial inside the app. How does the solver work? Essentially, it is just trying out a lot of possible moves to figure out if there is a way to win the game. A detailed writeup about its technology can be found in this report. Well then we kindly ask you to contact us and we get back to you at our earliest convenience. "Das Spiel ist nicht ganz einfach, aber machbar. Wer Freude an Knobelspielen und Denkaufgaben hat wird Freude an Martello haben." "Obwohl die Grundidee dieselbe bleibt, hat man von den digitalen Möglichkeiten Gebrauch gemacht. Man kann nun die Schwierigkeitsstufe bestimmen und die Grösse des Spielfelds wählen. Als Ungeübter hat man die Chance, zuerst klein anzufangen. In der Bibliothek können die gespielten Situationen nachvollzogen und die Spielzüge analysiert werden. Der pädagogische Charakters des Spiels kann damit sicherlich verbessert werden." Of course we are more than happy to provide any additional material. Just let us know. 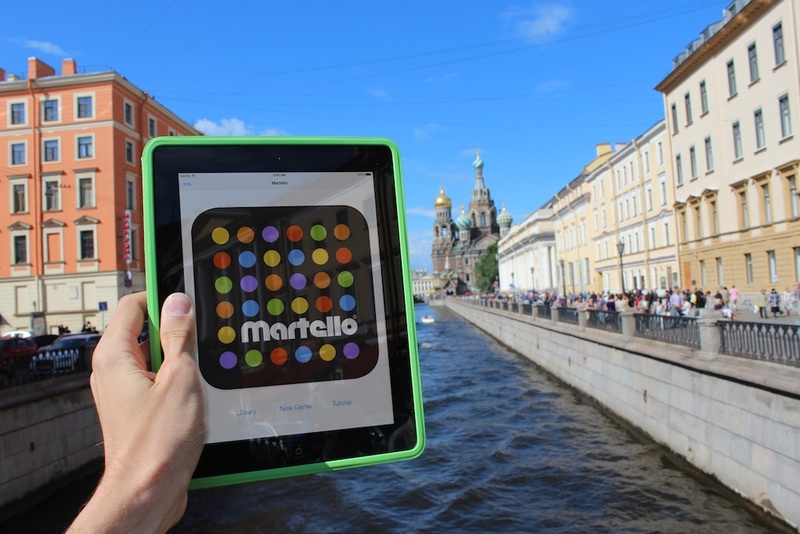 This is our collection of people playing Martello all over the world. 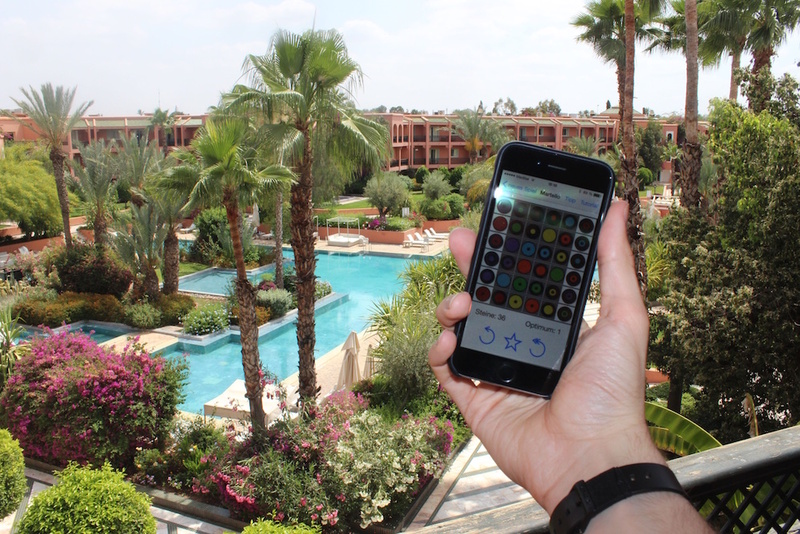 Let us know if you are also playing Martello in some exotic place. 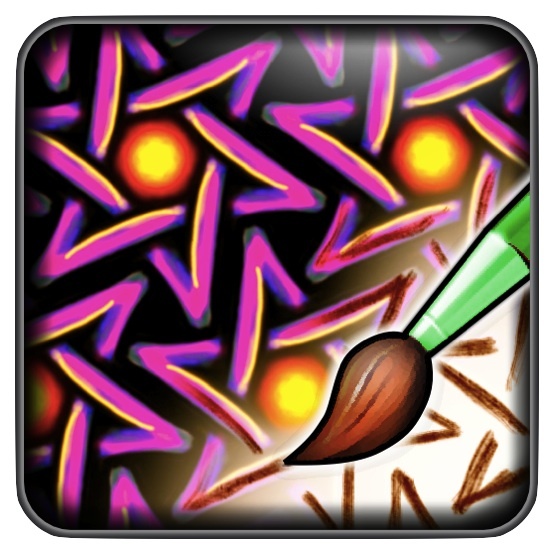 A beautiful app to draw and design your own ornaments. A perfect combination of art and science. 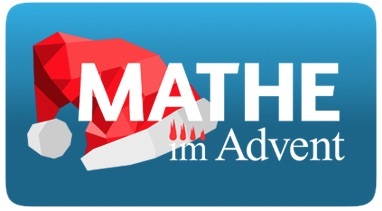 We can recommend this German site for your kids or students: Mathe im Advent. These digital math advent calendars are a free offer of the German association of mathematicians and are suitable for kids from second to tenth grade. You can also win one of 24 Martello board games there! 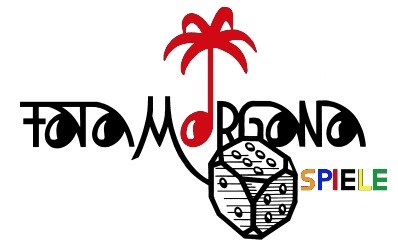 The board game publisher Fata Morgana is selling the original board game version of Martello. 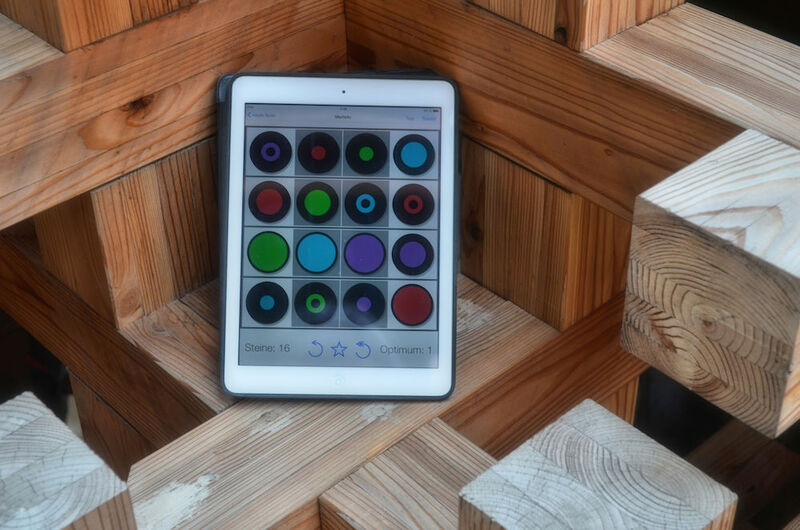 It's the perfect gift and an ideal complement to the app.! Fata Morgana also sells more awesome games like "Tichu" or "Der wahre Walter". Do you have any questions or problems? Let us know if you like the app, found a bug or just want to say hi. The app does not collect or store any kind of personal data. The only data stored is the list of games played. This list is only stored on the device and does not get uploaded or transmitted in any way. The app does not connect to the network at all, except if you click on one of the links in the 'info' section.